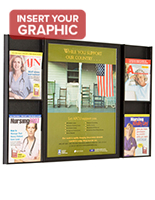 Want to feature promotional material of varying sizes? 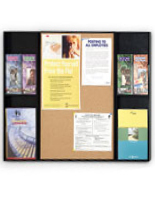 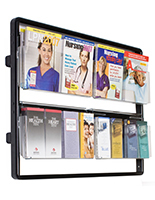 Our wall mounted brochure and magazine holders feature adjustable pockets to display both 4x9 and 8.5x11 literature. 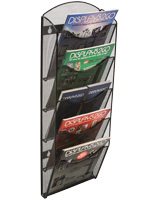 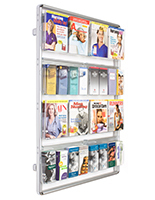 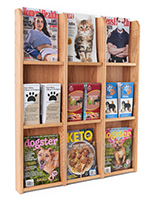 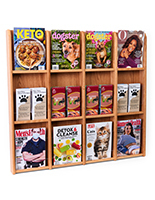 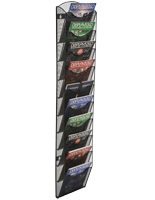 These plastic, wood, and metal booklet racks are great for advertising print media campaigns in corporate lobbies, doctor's offices, and service organizations. 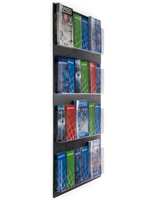 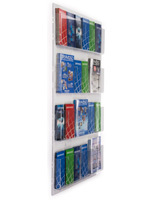 Wall mounted brochure and magazine holders are ideal for banks, travel agencies, and accounting firms where they can outline products and opportunities for clients. 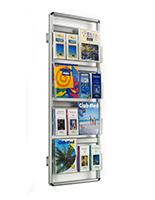 Adjustable literature displays feature large quantities of leaflets on doors and partitions to save floor and counter space for these businesses. 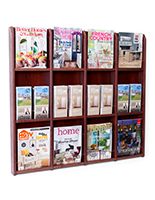 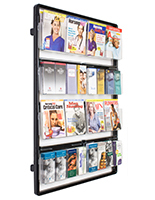 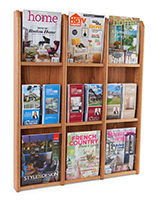 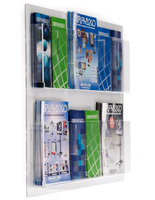 Browse our wall mounted brochure and magazine holders to manage print media campaigns. 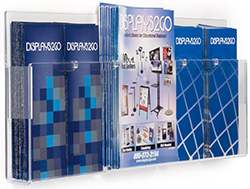 Why choose these leaflet and booklet mounts? 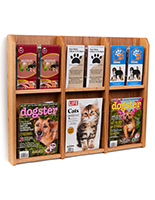 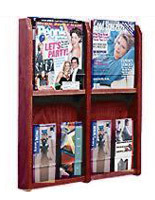 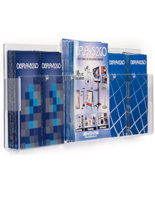 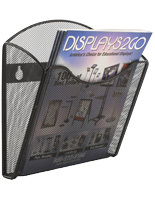 Wall mounted brochure and magazine holders have adjustable pockets for displaying two common media sizes. 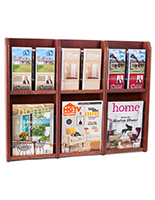 A single 8.5x11 catalog slot fits two 4x9 pamphlets when an included divider is inserted. 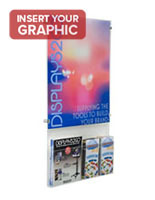 This is excellent for shared buildings where companies will display their own unique marketing materials. 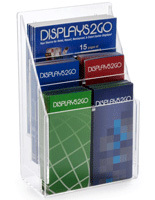 Companies can feature their leaflets side by side, allowing visitors to take whatever they're interested in. 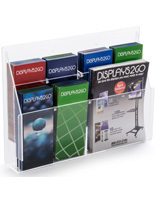 Most of these wall mounted brochure holders have clear acrylic pockets that keeps promotional literature highly visible. 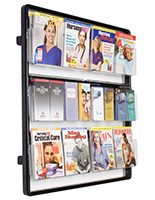 These see-through plastic slots ensure that passersby can clearly see messaging and artwork on the covers. 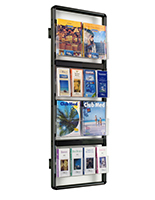 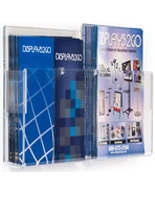 Some of our metal racks have mesh slots that also give booklet covers high visibility. 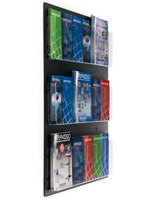 Wall mounted brochure holders have large, multi-pocket displays for holding large quantities of take-away literature. 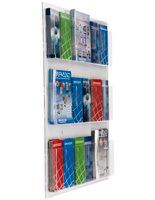 Browse organizer mounts with up to 32 slots for 4" wide pamphlets — which can be converted to 16 shelves for 8.5" wide catalogs, or somewhere in-between. 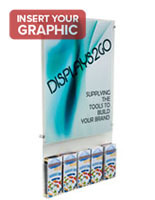 Their large storage capacity is another reason why they should be found in building lobbies with multiple businesses. 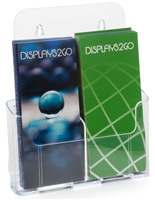 These leaflet and booklet mounts are offered in a number of fabrications to match different environments. 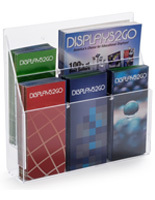 Plastic and acrylic mounted brochure holders are sold at affordable prices. 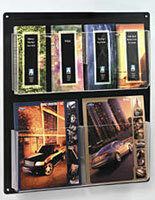 These are available with sleek black and clear finishes that give businesses and their messages a modern presentation. 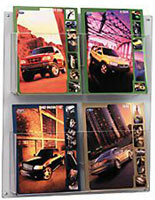 Metal booklet organizers also feature contemporary designs, whether it's sleek wavy silver or black mesh. 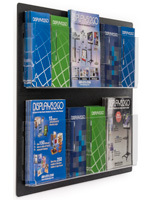 Choose from rugged industrial appearances and clean, modern presentations when presenting your take-aways. 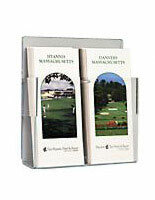 How about a classic design with wooden mounted brochure holders? 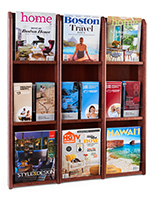 Wood finishes are ideal for banks, law offices, and other organizations that need a traditional or upscale presentation. 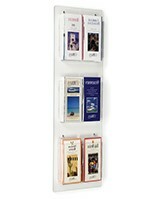 How else can you use literature holders to boost brand presence? 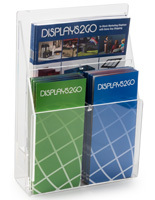 Our custom printed pamphlet dispensers include logos and messaging in full color. 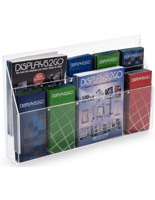 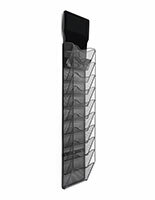 These branded acrylic organizers are excellent for commercial events and office lobbies. 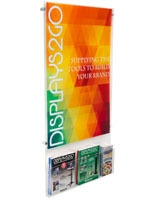 There's no better way to build up your brand than with professionally printed promotional displays.